It’s that time of the year again beauty addicts! The VIB Rouge sale has been unleashed and is upon us once more. While I do have my eye on a couple of items, I’m not going to indulge too much because I am currently saving up for my trip to South Korea next month. Anyway, here are my picks from the sale. One of the eyeshadow palettes I thought would be good for everyday use is the Tartelette Toasted Eyeshadow Palette. I don’t have a lot of eyeshadow palettes from Tarte but I know I definitely want this. The Anastasia Beverly Hills Radiant Blush Kit seems like a sweet deal for me considering there are 4 beautiful shades for only $30. And with 20% off? Yes, please! I have already ordered the Violet Voss Taupe Notch Eyeshadow Palette through one of my trusted sellers and I’m patiently waiting for it so I can add it to my other Violet Voss palettes. The Bite Beauty Mauvember Limited Edition Collection for 2017 has both the liquid lipstick and the multistick. I’ve heard a lot of wonderful things about the brand and for all you out there, now’s a good time to get this pair! Then there’s Burberry’s newest limited edition Festive Silver Shimmer Illuminating Powder for the season. So pretty! I’ve been seeing a lot of people on Instagram purchase the Kevyn Aucoin Neo Trio Palette which has a bronzer, highlighter and a setting powder. It seems like a good buy noh? Then you have the Bobbi Brown Highlighting Powder Trio. How can you go wrong when Bobbi Brown’s best selling highlighters are all in one palette. 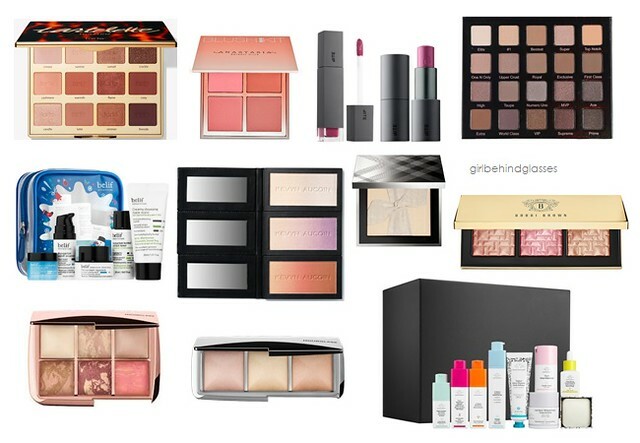 Also from Hourglass, the Ambient Lighting Edit Volume 3 Palette and the Ambient Metallic Strobe Lighting Palette.Why? Well, because their palettes always leave me impressed. I have these two already but if you’ve got these on your wishlists, now’s the chance. I think the Belif Bestsellers On-The-Go Travel Kit is a great set for anyone who wants to try their products or is looking for a travel set. You’ve got a cleansing foam, a toner, an essence, eye cream and a moisturizer. Sounds like a great deal right? Anyway, I’ve ordered this too, LOL. And if I have a lot of moolah, I’d be getting the Drunk Elephant The Trunk. Nine full-sized — or so I think they are — Drunk Elephant skincare products. I don’t think there can be anything better than that. But a pricetag of $425? It’ll just be here on my wishlist. Twenty percent off on everything guys! Who’s crazy enough to pass that offer? Not me! What are your picks for this years sale? I’m so tempted by the Drunk Elephant sets! I’ve heard really good things about their product but they’re quite pricey – the VIB sale is definitely a good time to get their products.